Because you don’t feel like slaving over the stove after a long day of work (whether that’s meeting deadlines or keeping your kids alive) and delivery takes too long, I’ll post a fairly easy and quick recipe every other Monday. If you try it, please leave a comment letting us know how it turned out! 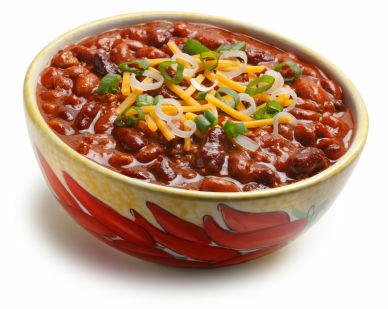 Today’s recipe is a 20 minute chili that’s sure to please. Sorry, no tips yet on how to get your toddler to eat it. Brown the meat in large skillet on medium-high heat. Drain fat. Or if you don’t feel like it, look for Old El Paso taco-seasoned ground beef in the refrigerated case of the meat department. Omit the McCormick Chili Seasoning Mix and add a ½ tablespoon of chili powder and ½ teaspoon of ground cumin. Stir in seasoning mix, tomato sauce and beans. Bring to boil. Reduce heat and simmer 10 minutes, stirring occasionally. In just a few extra minutes, you can add assorted toppings, such as chopped onions, shredded cheese, a dash of hot sauce, saltines or sour cream. Double or triple the recipe and freeze leftovers for an even quicker dinner later. Finally, add a nice glass of zinfandel (for you, not the kids). Yum that sounds so good and soo easy especially for these colder days. Thanks!